Modalities intended for “Presenting” are not always as strong at “Defining” solutions. A rendering of an object or interface is only so good without the designer to talk it through or notations of their intent. For most things we pursue creatively, we need a balance of resolution and fidelity to get things just right. The creative path should meander. There is more than one way to do most anything. Graduate thesis design work is no different. Some students start with a prototype of something in their mind and work from there. Some students fill notebook after notebook with their thoughts and feelings about what to make and have made maps to make it and experts to quote about considerations for it, but have not yet started to dive in to the making. And this is fine as well. This is who they are and how they work best. In my opinion, the path meanders because it is supposed to. 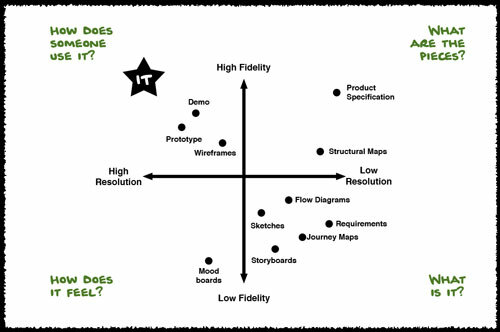 The one certainty is that we aim to land in the sweet spot of a high resolution, high fidelity solution. Resolution has to be measured against intent. Magritte has a famous painting of a pipe that says “this is not a pipe” under the painting in french script. If Magritte’s intent was a painting of a pipe (which it was) than this painting is as high resolution as he needed to get. If on the other hand Magritte’s intent was to manufacture pipes, this deliverable is maybe mid way up the resolution spectrum, while remaining high fidelity. When you are hammer, everything looks like a nail. I asked my students to spend some time thinking about the work they do and plotting the outputs they create onto these resolution/fidelity quadrants. In doing so I hope they realize that many of them are “making plans” or “making things” — and their intent as discussed weeks ago is still almost always somewhere between those two. Looking out at the nine weeks left I can say that I am excited to see what happens next. More importantly I can say that I have a much deeper appreciation for how hard creative pursuit really is. My deck for Considering Resolution is available.